Intel Corporation is committed to the highest levels of corporate accountability. As a way to provide transparency with respect to Intel’s political contribution decision making and disclosures, Intel adopted these Intel Political Accountability Guidelines (the “Guidelines”). Intel created the Intel Political Action Committee (IPAC) in 1980 to enable employees to support candidates... whose legislative goals align with Intel’s public policy priorities. Intel’s approach is to make contributions in a non-partisan manner based on set criteria. Intel’s ultimate goal in making political contributions is to support candidates with the goal of protecting and enhancing long-term stockholder value. 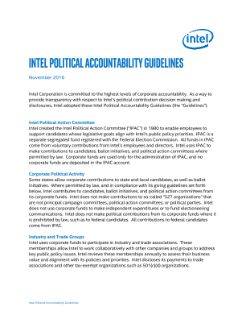 Intel’s Global Public Affairs and Government and Policy Group review and analyze Intel’s corporate and IPAC political contributions regularly to ensure contributions made during the year are consistent with these Guidelines. Intel reports its corporate contributions and IPAC contributions on a semi-annual basis. Intel also reports payments to trade associations and other tax-exempt organizations on an annual basis. These reports are available on Intel’s Report Builder website. Read the full Political Accountability Guidelines for further detail.